With this book, you can build exciting, scalable web applications quickly and confidently, using Google App Engine - even if you have little or no experience in programming or web development. App Engine is one of the most exciting web technologies to appear in the last year, providing a simple, easy-to-use application framework with basic web tools. While Google's own tutorial assumes significant development experience, "Using Google App Engine" is for anyone who wants to get started with this platform. By the end of the book, you'll know how to build complete, interactive applications and deploy them to 'the cloud,' using the same servers that power Google applications. You will: get an overview of all the technologies necessary to use Google App Engine; learn how to use Python, HTML, Cascading Style Sheets (CSS), HTTP, and DataStore, App Engine's database; grasp the technical aspects necessary to create sophisticated, dynamic web applications; and, understand what's required to deploy your applications to Google servers. In addition to being a foundational resource for beginning programmers, "Using Google App Engine" is also an excellent book for experienced programmers who want to acquire working knowledge of web technologies. Building web applications used to be for experts only, but with Google App Engine - and this book - anyone can create a dynamic web presence. Charles Severance is a Clinical Assistant Professor in the School of Information at the University of Michigan; he has also taught Computer Science at Michigan State University. Charles also works with the IMS Global Learning Consortium as the IMS Developer Network Coordinator. Previously he was the Executive Director of the Sakai Foundation and the Chief Architect of the Sakai Project (www.sakaiproject.org). Charles is the author of High Performance Computing, Second Edition, published by O'Reilly and Associates. His home page is http://www.dr-chuck.com. For starters, you have to know when buying any book on software, some code examples will not work at they are printed on the pages and unless you were born last night, you know software changes with every new version. Sometimes a simple Google search is all you need to find version changes for code you find in books. At the time I read this book, Google App Engine prefers the stable Python 2.7 - so don't download version 3 -point-anything if you want to try examples in this book. 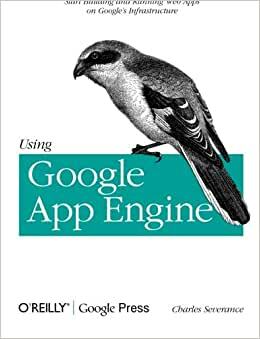 The book is a good place to start for learning about Google App Engine, it's concise, not overly wordy and the stuff works. This book was designed and written for a specific class offered through the School of Information at The University of Michigan. It is literally designed to follow along week by week with the class, so whether it is useful or not outside of the class I don't know, but I found it very helpful to follow along with the class. If you're not in this class you might be interested to know that if you go to [...] there are lecture slides and audio to go along with each chapter. Using App Engine involves many technologies. If you are weak in any of them, or don't understand them, you probably won't actually get a program up and running on App Engine. This book has a very narrow aim: to walk you through all the basics you must know. Included is getting the App Engine SDK installed on your machine. I wish Google's App Engine site had this information in such a clear, step by step form. I am an experienced programmer, so it's hard for me to judge Chapter 3, which covers Python. The book states that it can be read/used by non-programmers. Ch. 3 tries to introduce programming and Python in 30 pages. It looks like a nice attempt, but maybe a bit ambitious. The book focuses on building up the pieces for a very simple chat application. Using this book you will have everything up and running quickly, will understand everything that is being done, and will be ready to seek out more complicated apps (which are readily available on the web). If you aren't a geek, and want to get started with App Engine, this clear, concise book will be your best friend. I had no idea that I would need to be mildly proficient in numerous markup languages to be able to write my app to run on the google app engine. This book enlightened me without discouraging me. It walked me through how to tie together, HTML, CSS templates, Python and Google's Datastore. This author is a gifted teacher and is what I needed as an introduction to the Google App Engine. He walked me through the different languages and gave me the confidence that I could do it. Like any good teacher, he walked me through it and encouraged me the whole while, giving me the confidence I needed to confront the Google app engine. I highly recommend this book, especially if you not already proficient in HTML, CSS templates, Python and the Datastore. If you are already proficient in all of these languages, this book may be too basic for you.